Here's a frightening Halloween statistic: Children are, on average, more than twice as likely to be hit by a vehicle and killed on Halloween than on any other day of the year, according to Safe Kids Worldwide. Trick-or-treat nights are dark and kids are excited (and probably not focused on safety). Any child under 12 should be supervised by an adult and older children should be reminded of safety tips before they head out. One of the most important tips for children and adults going out on Halloween is to be seen. If your costume is dark, consider adding reflective tape or carrying a flashlight. Or, even better, head to your local dollar store and pick up plenty of glow sticks. Kids love them and they will let motorists see your child in the dark. Instead of masks, use face paint to complete a costume. Some masks can obstruct a child's vision. Additionally, make sure your child's costume fits properly and isn't too long so they aren't tripping and falling. Cross at street corners, using traffic signals and crosswalks when available. Don't walk distracted. Put down electronic devices. Always walk on sidewalks, when available. If there is no sidewalk, walk facing traffic. 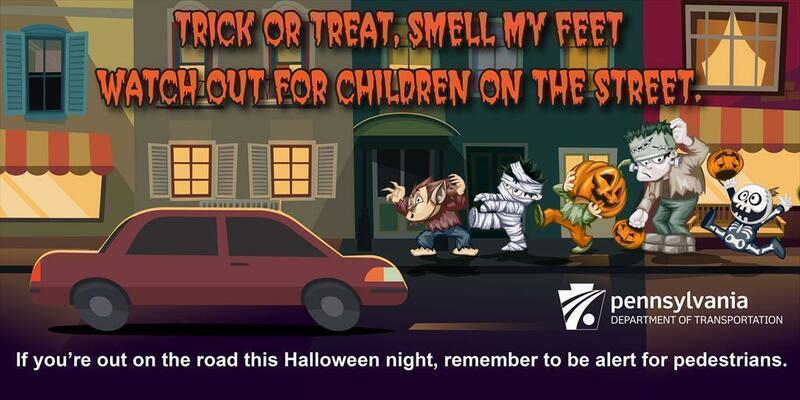 If you're out driving on Halloween night, you should be extra cautious, especially in residential neighborhoods. There will be lots of children out, who aren't necessarily paying attention to you and your car. Slow down and always be aware of your surroundings. Take extra time at intersections to be sure there are no children looking to cross the street. For more Halloween safety tips, check out the resources page from Safe Kids Worldwide. And remember, everyone is a pedestrian, so we should always be sure to walk safely.